The elders of this way of life embody a tradition of immense spiritual magnitude, whose importance is just beginning to be understood. The ceremonial drinking of yagé as a mystical science and wellness regime is undeniably one of the great world heritage traditions. One that is an effective, holistic and time-tested medical system of universal significance. This ceremonial sacred science teaches each individual how to develop the appropriate poise and orientation to achieve communion with the always new celestial immortals. This ancient tradition was received hundred if not thousands of years ago by the ancestors of the current day Secoya people, from the upper Amazon regions of Ecuador and Peru, on behalf of an encounter with “Gods Multicolored People,” who taught them the tradition as a way to recuperate our original nature and like this found our way back to the celestial realms. The account is documented in the book “Rainforest Medicine” on page 78-81. The tradition aims at teaches participants to strengthen their bodies, the science behind ethics and achieving health on all levels on ones being. All, while laughing a lot and having a good time! The elders of this culture embody a tradition of immense spiritual magnitude. As the modern era rips apart the seams of ancient human fabric, the way of life of the Secoya, a heritage of humanity, remains an ever effective time-tested medical system of universal significance. The spiritual and ceremonial science these elders joyfully transmit is one of the great wisdom traditions of Gaia, and its importance is just beginning to be understood. Rekindling our memory of the most ancient prophecies of universal oneness, it is a wonderful tool for deep self introspection, granting the vantage point that allows one to improve every aspect of our lives, and to allow joy and peace to permeate ones being. It is a way of life that brings all subtly together back onto the one great path of universal wholehearted living, the one that walks alongside everything and everyone together towards an integral salvation for all species alike. 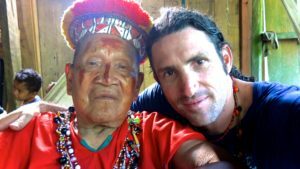 Sadly, geopolitical borders, the encroachment and harassment of the petroleum companies, and the devastating impact of colonization now imperil the culture and ancestral lands of the Secoya people. Despite these changes, the Secoya still live with grace, devotion, non discrimination, non impulsiveness, and natural presence, and are happy to share their way of life with those who come with sincere hearts. The great-hearted Secoya elders were raised in the wilderness, living traditional ways of life that include copious ceremonial meditations. They share visions and sacred designs too spectacular to be acquired in any other way, other than by sitting with them through the timelessness of the cool nights of yagé. Indelible to their way of being is this “great spirit, bedecked in designs, aromatic, beaded and leafy”, acquired while fasting with their maestros in their rainforest motherland. Their presence represents both the sacred gift and the serious joke that is life. Participating in ceremonial life with them offers an ever-pertinent perspective of navigation for these tumultuous times. They are traditional Secoya elders, torchbearers of this millenary spiritual tradition. 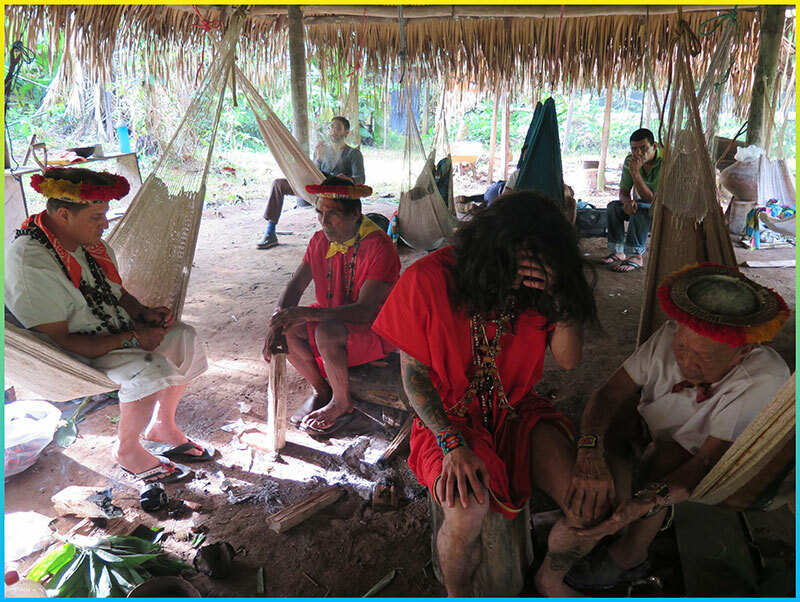 Upcoming Rainforest Medicine Gatherings to the Secoya ancestral homelands will be posted on the Gatherings page.